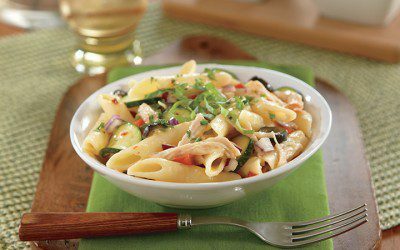 Combine pasta, chicken, onion, bell pepper, zucchini, olives, red pepper flakes and salt in large bowl; toss lightly. Combine soup and lemon juice in small bowl; mix well. Pour soup mixture over pasta salad; mix well. Sprinkle with Parmesan cheese, basil, and parsley. Serving size: 1 1/4 cups salad. Exchanges per serving: 2 Bread/Starch, 1/2 Fat, 2 Meat.